Deworming horses can be done in two ways. You can use paste horse dewormers or a feed through horse wormer. Pelleted type feed-through wormers are a daily additive that you give with your horse's grain ration. If you use this method, simply follow the instructions on the label. Paste wormers come in a plastic syringe. The plunger on the syringe is marked off in increments of 250-300 lbs. The plunger also has a little plastic ring on it. This ring is used to set the proper worming dose that you will be giving your horse. Before you can start deworming horses you have to know how much they weigh. Unless you have access to a giant scale, use an ‘equine height and weight measure tape’. These are very inexpensive horse measuring tapes that can be found at your local feed stores and tack shops. With your horse standing on a fairly level surface, take the tape measure and wrap it around your horse's girth area just behind the withers. Pull the tape snug but not tight and read the measurement. You may try this 2 or 3 times and take the average. Once you know how much your horse weighs, you are ready to set the dial on your paste wormer to the correct dosage. Twist the plastic ring on the plunger to unlock it. Slide it over to the appropriate weight marked on the plunger and then twist it back down to lock it in place. Remove the small plastic cap on the tip of the syringe. For the most part deworming horses is easy, but if your horse is not cooperative, it can be challenging. 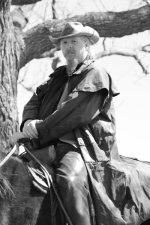 Some people prefer to have their horse tied and some prefer to have their horse free standing. That’s up to you. At minimum you’ll want to halter your horse. I like to tie mine. The objective is to get your horse to swallow the set dose of paste without spitting any out. If you’re like me and you like to give your horse treats, don’t give them a goody until after they have swallowed the paste. If your horse has a wad of grass in her mouth, she’ll spit the paste and the grass out together in one gooey mess. When deworming horses, you’ll want to stand to one side of your horse's head. 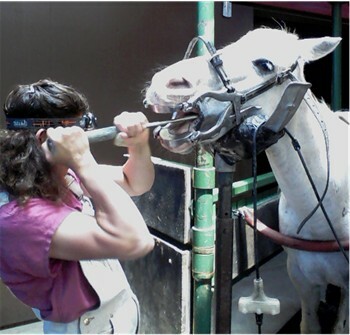 Place the syringe in the side of your horses mouth, starting at the corner of his lip and sliding it over the gums. Aim the tip of the syringe to the back of the tongue as far back into the horses mouth as you can reach without getting bit. Then quickly push the plunger in to dispense the paste. Try to do this in one swift movement. Most horses will try and push the syringe out with their very strong tongues. If you can place the body of the syringe between the teeth and the tongue while the tip is aimed to the middle of the tongue, they have a harder time pushing it out. It has been my experience that the faster you get the syringe in and out of your horses mouth, the more tolerant they are about it. It’s quite common to get the bulk of the paste down and have the horse spit some portion of it out. If this happens, and you have some paste left over in the syringe, you can use it to replace the rejected portion. You’ll have to use your best judgment as to how much was lost and how much you need to give again. 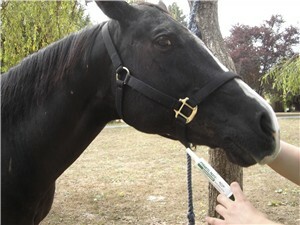 If you have a horse that is very uncooperative, and you just can’t get that syringe in their mouth don’t panic. You can often get the paste down your horse by mixing it into a treat. The trick is in cleverly hiding the taste and seeing that they eat their full dose. I have done this successfully with a mix of cubed apples, diced carrots and a bit of sweet grain with molasses. Stir the dose of worming paste in well. 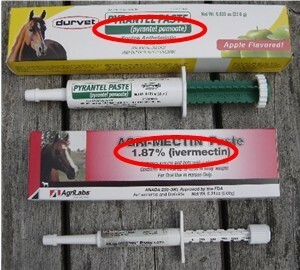 Most horse worming pastes have an artificial apple flavor to help disguise the taste, so it will fit in nicely with your apple/carrot/grain concoction. Just mix enough of this that you know your horse will eat the whole thing. Worst case scenario, if you absolutely can not get the paste down your horse, you can always use a pelleted feed through horse wormer. Deworming horses is more important that what method you choose to do it with. Get your own handy deworming chart to keep track of your wormer rotation schedule by clicking here. Learn when and what to use for your horse worming program. 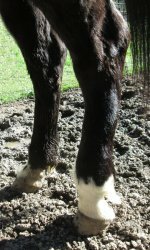 Get the essentials of hoof care and recognizing hoof problems. The 10 signs your horse may need their teeth floated.